Automatic fire extinguishers are the only real answer to fire safety in most unsupervised situations. When expensive agricultural, construction, mining, electrical and machinery equipment are present, it will often be too late to combat by the time the fire is discovered. That’s why automatic fire extinguishers are the ideal solution for such scenarios. 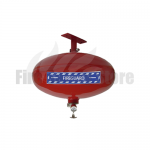 They are installed directly facing identified fire risks and are manufactured to automatically discharge in the event of a fire and works on extinguishing the blaze. 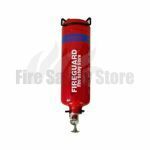 Here at Fire Safety Store, we are thrilled to be able to offer dry powder and clean agent automatic fire extinguishers in a variety of sizes. Our dry powder varieties are effective against Class A (solid combustibles), Class B (flammable liquids) and Class C (flammable gases) fires. They have a sprinkler head so powder is evenly spread across the entirety of a blaze for effectiveness dousing of fire. They are perfect for use in small unmanned areas as they can react much quicker than somebody who is not in the area. They also come equipped with an easy to read pressure gauge to ensure that inspectors can clearly see the contents and make a decision on replacements. 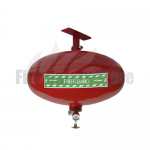 Our clean agent automatic fire extinguishers are popular choices in delicate enclosed areas such as computer rooms, telecomms rooms and boat engine compartments. These extinguishers are an almost equivalent to the no longer being manufactured halon extinguishers, in the sense that they effectively tackle fires without leaving any residue. These clean agents, leave no lasting effects on the environment, making them cleaner and safer than the traditional halon alternatives. There is also an easy to read gauge applied indicating how much is left in the extinguisher. This extinguisher is able to deal with fires on its own, without the need of staff members. Just as with the dry powder version, clean agent canisters come with a sprinkler head for a wider reaching distribution when triggering has been initialised. 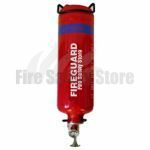 Every fire extinguisher provided by Fire Safety Store carry a five year manufacturer’s warranty as standard and this applies across our entire range of automatic fire extinguishers. 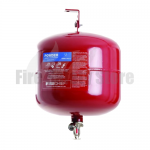 We also provide a complimentary wire bracket with our automatic extinguishers making storage handy and easy. Call us today on: 0800 316 0890 to find out more information about our catalogue of automatic fire extinguishers, or anything else that we stock here at Fire Safety Store. If you’re after something you can’t see online, we may be able to arrange something over the phone. Don’t forget that we offer next day delivery on orders placed before 2pm.